Have a great weekend, everyone. Remember that it's Free Comic Book Day on Saturday! I've been reading a lot more than usual (which is saying something, because I really like to read) since I got home from Eureka. It wasn't until yesterday afternoon that I realized why I've wanted to do little more than work my way through the gigantic pile of Books I Want To Read* for the last couple of weeks: I've had my brain set to CREATE OUTPUT for so long, I think I've emptied the tank again. I feel like this from time to time, usually when I finish a big project or wrap a particularly satisfying acting job, but never for this long or this intensely. I understand that it's fairly polarizing among Gibson's fans, but I loved this book from page one. It isn't anything like his Sprawl series, so if you tried Neuromancer because your geek friends wouldn't stop talking about it and didn't like it, this may be a good place to try Gibson again. This book was written and released shortly after Bruce Sterling's The Hacker Crackdown took the world by storm. It chronicles the exploits the infamous hacker group Masters of Deception, and gives an interesting perspective on their feud with the Legion of Doom. Like all of the stories written about the LOD/MOD feud, the subjects contest most of the facts as presented in the book, and like all of the stories written about hackers in the 80s and early 90s, it's difficult to tell what's fact and what's myth. I think that's a big part of the fun, though: when I interacted with a lot of these guys in the early 90s, they all seemed larger than life and mythical. Nobody really knew the truth except the guys who dialed into Tymnet, and then as now it was in their personal interest to make themselves seem a little bigger, their conquests a little more epic, their accusers a little more dastardly than they may have been. It's not as comprehensive as The Hacker Crackdown or as technical as The Art of Deception, and I found the author's efforts to strike a stylized, defiant, teenage tone distracting at times. Ultimately, though, it's a very quick and easy read, and the story they told was compelling enough to keep me engaged all the way through. In fact, it inspired me to go back to Textfiles.com and Phrack.com to reread a lot of those old philes that fascinated and intrigued me when the internet was 80 columns wide, built entirely out of text, connected by telnet, and delivered to your VT100 terminal emulator at 14.4K. Every issue of WIRED since November of last year has been fantastic, and I've read them all cover to cover. The current issue of 2600 has an important editorial about trust, privacy, and cloud computing. It's a good companion piece to this article at Ars about the Cloud and the Fourth Amendment. Yeah, there's clearly a theme here: I've had technology on my mind, both its (underground) history and its (uncertain) future. I'm not sure if I'll be able to convert any of this input into useful output, but I'm enjoying it so much, I don't really care. *also known as The Tower That May Kill You Or At Least Hurt You A Lot If It Falls On You. Yesterday, I saw this video linked at Reddit. I was a huge Night Court nerd when I was a kid, and from time to time I would ask Brent to do this character; hearing him say "Mi llamo es 'Bob'" in his Data makeup was as hilarious to me as it was surreal. I remember at one point around (I think) season three, Brent started making me laugh when we were shooting on the bridge, and then pretending he had nothing to do with it when I got in trouble ... his go-to bit was to just look across at me and say, very quietly, "Bob," in that character's voice. It killed me every single time. When I was a kid, I wanted to be as good an actor as Patrick, as cool as Frakes, and as funny as Brent. From time to time, one of them would say something to me that made me feel like I'd taken a step in that direction, and it always meant the world to me. I loved it when Brent would joke around with me, because it made me feel like I was the peer I so desperately wanted to be, instead of the clueless teenager I knew I was. 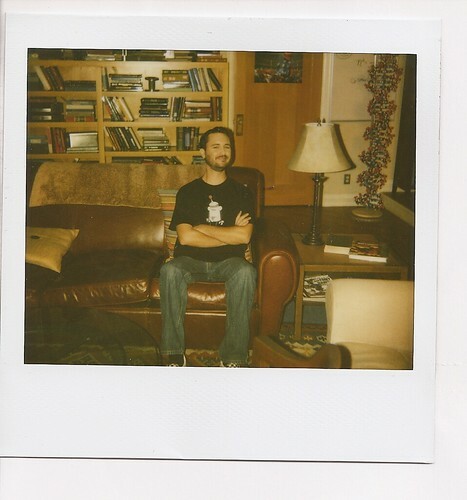 Wil Wheaton Prime uses Linux to bring you Evil Wil Wheaton sitting in Sheldon's spot. This picture was taken right after we finished shooting The Creepy Candy Coating Corollary last year. I'm not going to lie to you, Marge: it's one of my prized possessions. It's taken me this long to share it, because shortly after I upgraded my Macs to Snow Leopard, all of my Macs and my HP scanner stopped talking to each other. I spent a lot of time researching help forums, looking for updated drivers, and saying lots of swears, because it appeared that HP blamed Apple, and Apple blamed HP. My scanner still doesn't work with any of my Macs, but I am able to bring you this picture today thanks to the magic of Linux. If you've been reading my blog for a long time (or you've gone through the archives) you know that I love the Linux operating system. I first switched to Linux in 2002, and eventually ended up running a heavily-modified version of Debian for years, until I was seduced by the elegance and stability of OS X. From time to time, though, I grab a LiveCD (usually Ubuntu, these days, though I've gone through most of them at one time or another) and spend an hour or so poking around to see what's new and how quickly I can break it. My incredibly short review: I liked it. I thought it looked nice on my iMac, it booted fast from the DVD and ran smoothly once I was logged in. It comes with enough software to give a curious user a good feel for what it does without overwhelming them with options, and it autoconfigured every single thing I had ... including my HP scanner. When I realized I could finally scan this picture — and get a cool Linux advocacy story — I took carefully took it off the top of my desk (where I stuck it with two-sided tape several months ago) and scanned it. I put a thumb drive into the machine, which Ubuntu recognized immediately, copied the file over, and ran into my office to put it on my MBP. I remember, back in the old days when we had to use vi to edit our config files, how much we all longed for a day when Linux Just Worked™; I think it's pretty cool that, in this case, it did. I had a very short day today, and was wrapped just after lunch, so I had the afternoon to myself to take care of some very important business. The good news is that I was given permission to twitter and photograph from the set of Eureka. The bad news is that this episode is so awesome, everything I'm shooting or watching is a special delivery from Spoilertown ... so I end up taking boring pictures of the outside of the old Battlestar Galactica stage. This may seem silly, but knowing that I'm >this< close to where that show was made gives me a little bit of the nerdsquee every morning. I mean, it happened right there! I thought some of you would like to know that Neil Grayston is awesome. I've worked with him in all of my scenes, and I really like him. It turns out that we have a lot in common: we both played D&D when we were kids (I started with Basic, he started with 2nd edition AD&D), we both love acting, we both like science fiction, and we both love being on the show. Okay, now back to (my) business. When I came up here last week, I felt like my suitcase was lighter than it should have been. I decided that it felt that way because I didn't bring a heavy coat, and I was used to carrying suitcases to cons, which are usually pushing the weight limit with books and pictures inside. Well, when I got here and unpacked, I discovered that my suitcase was light because I'd left a load of laundry in the dryer and hadn't packed it. Oops. Luckily for me, I had enough of everything I needed except jeans and socks, so on Saturday, I ran over to a nearby department store and bought 4 pair of socks plus two pair of jeans. This morning, when I was getting ready to get dressed for work, I saw that the cashier dude hadn't taken that giant plastic alarm-ringer-thingy off one pair of the jeans I'd bought. Luckily, I saved my receipt so I could get my GST back when I go home, so I knew I could just go there today after work and get it taken care of. I felt very self-conscious walking around with a pair of jeans folded up underneath one arm for reasons I can't explain, and I guess I had good cause to feel weird about it because I was really aware of people looking at me when I walked past them. On my way to the store, it started to rain, so I decided to walk through a different department store that was a block closer than my destination. Of course, the alarm went off on the way into the store, drawing even more unwanted attention my way. I waited to see if someone in the store would come over and see what was going on, but nobody did, so I walked through the store and out the other side. The alarm went off when I went out. I thought, "Seriously? This couldn't have happened once on Saturday, and it's happened twice today?" An older man in a long coat and a jacket - looking very much like one of the bankers the headcrusher guy from Kids in the Hall hates so much - gave me a withering look, like he was convinced I'd stolen the jeans that were rolled up underneath my left arm. I can see why it would have appeared suspicious to, well, anyone. Again, I waited for someone to come over, and again nobody did. "Maybe Canadians are just more trusting than Americans," I thought, as I walked across the street and into my destination. As I stood at the light and waited to cross, I noticed that a pair of girls were looking at me and whispering to each other. "Okay, Wil, you're totally being paranoid now. Maybe it's time to go back to the hotel and lie down for a little bit. Also, the light just changed so get a move on." I walked into the store, and the alarm went off. "Of course," I thought. I headed to the first cash register I could find, and waited. When an employee arrived, I blurted out, "I'm not a criminal!" She looked at me like that's exactly what I was, so I continued in what I hoped was a calmer voice, "I bought these on Saturday, and the guy forgot to take the tag off." She looked at me warily. "I have the receipt," I said. I pulled it out of my pocket and set it on the counter. I remembered a day, about a year ago, when I was at a Staples near my house buying printer paper (yeah, they've got that) and a couple of full-on tweakers came in, trying to "return" a handful of pens and stuff they carried in a well-worn plastic bag. The manager made them immediately, and while the female half of the couple tried to convince him that they'd bought them the day before and just didn't need them, a car alarm went off in the parking lot. The guy half of the couple was seriously high - picking at his neck, tapping his foot, the whole thing - and he started looking around furiously while he said with increasing volume, "Alarm! Alarm! Alarm! Alarm! ALARMALARMALARMALARM!" I got out of there before things got ugly. Well, uglier, anyway. The cashier looked at me again while she picked up the receipt, and I was convinced she was seeing that tweaker couple in my face. "I have the card I paid with if you want to verify that I'm telling you the truth," I said. I don't know why I felt so guilty, but I wouldn't have been surprised at all if I got the tap on the shoulder and the "Sir, will you come with me, please?" After what seemed like a very long time, she apparently decided that I wasn't making up a story, took the plastic alarm thingy off, and gave me back my jeans. "Do you think I could have a small bag, please?" She just looked at me with a mixture of incredulity, confusion, annoyance, and other. "I feel a little weird carrying a pair of jeans around town," I explained. With obvious reluctance, she gave me the bag. Needless to say, I got out of the store pretty quickly. ...and that's when it hit me. "Oh. People are looking at me because I was on TV last night and they're trying to figure out where they've seen me before." Mostly out of relief, I laughed out loud and relaxed for real this time. I walked back to my hotel feeling fitter, happier, more productive. It's Sunday afternoon as I write this. I can't publish this manually, because if I've read my call sheet correctly, I'm currently playing Dr. Isaac Parrish on Eureka. If we're on schedule, I'm working in a scene with Erica, Colin, and Neil. If my experience on the show so far is any indication, I'm having a whole lot of fun right now. Final If: If I've pushed the right buttons in Typepad, this should have published about one minute after The Wheaton Recurrence finished in the Eastern time zone. If you haven't seen the episode yet, you don't want to click more, because it's going to be spoileriffic. I'm in Canada, working on Eureka, so I couldn't watch the previews CBS put online for The Wheaton Recurrence. Using all of my Evil Wil Wheaton powers, I contacted a sympathetic mole deep within the CBS Fortress of Power and got my hands on this preview. * I'm sorry I had to disable embedding, but it's the only way I could outrun CBS's army of lawyers. I'll leave it online as long as they let me. 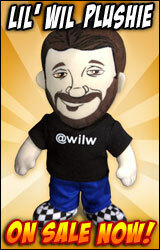 Believe it or not, it was really difficult to get the timing just right on the reveal of Evil Wil Wheaton. The camera had to move into a precise position, and then Jim and I had to be in exactly the right place when he sat up and I turned around. I think we had to try it eight times before we finally got all the pieces to click together correctly. The Wheaton Recurrence airs Monday, April 12, at 9:30pm on CBS. *CBS asked me to take the video down once the episode aired. Since I'd like them to employ me (and let me do awesome stuff like this) in the future, I complied. Greetings from Vancouver, where I sit high above the city, looking out over a balcony, through a sliding glass door that I dare not open, because single digit temperatures in Celsius are just as cold as their Fahrenheit cousins. If you're joining the broadcast late, I'm here for an episode of Eureka, playing a brilliant-but-sarcastic scientist who is sort of a nemesis to Fargo, and my episode airs July 23rd on the Sci-Fi – *grumble* I mean SyFy – channel. The cast and crew of Eureka are, without exception, awesome. Every single person I've interacted with has been incredibly kind and welcoming, and I instantly felt at home on the set. I've only been here two days, but it feels like everyone likes each other, which confirms what I'd heard from people who have worked on the show when I asked about it. We did a read through of the episode yesterday, but not all of the actors could be there, so a lot of the regulars just filled in for them. I thought I was going to fall out of my chair laughing when Colin Ferguson read one of them - who will remain nameless - in a voice that was disturbingly (or amazingly, depending on your point of view) similar to Mayor McCheese. After fifteen minutes with him, I could see where Carter's wry humor comes from. Last night, I had dinner with my friend Aaron, who is also an actor and lives here. While we were waiting for our check, he asked me if I was excited to "go be an actor for a week." "I really am," I said, "but I'm also a little nervous. I've spent so much time being a writer, I'm afraid that I'll get stuck in my head once I'm on the set." I was talking about this thing that can happen to actors who are over-prepared or inexperienced. To really live in a scene and to really be connected to the other actors, we have to stay in each moment, reacting honestly and simply to what the other actors are doing. I do a ton of character preparation. In addition to knowing what my lines are, I know why I say each one. I know all sorts of stuff about my characters, because the more I know about a character, the wider my range is when I play him. I need to know what I want from each other character, what my purpose is in a scene, and then let all of that stuff fall away into some kind of subconscious background noise while I'm actually performing the scene ... or I'm stuck in my head, thinking about things and watching things, instead of living in the scene. I continued, "so I think I'll probably be a little rusty at first, but I've done this long enough to trust that I'll settle in. Not as quickly as I'd like, but I'll settle in." "Well, I'm sure you're going to have a great time," he said, in that way one actor tells another to get the frak out of his own way, trust his instincts, and just enjoy the work, without really saying that. It's sort of a pep talk between friends, I guess, and it's one of those things that I just love about being an actor with some good friends. I got to work with Neil and Erica for 6/8 of a page today, and though it took me longer to find my character and settle in than I wanted, it was, as they say, like riding a bike ... and I didn't even fall off and scrape my knees. Between rehearsal and filming today, I walked around the set a little bit. It's magnificent; I felt a sense of wonder and awe that I haven't felt since the first time I walked through the Enterprise on stage nine in 1987. The little details, like the signs on the walls, fingerprint scanners at the doors and the texture of the fake concrete make it feel like it's an actual building that happens to extend fourteen stories underground. I just love that I get to use my imagination to pretend I'm a person who works in this place. Vancouver is as beautiful as I remember it, and since I have the next three days off, I plan to put on my tourist hat (which is actually just a PAN Fleece to carry my geek gear) and see as much of it as I can. If any locals want to mention some must-see places – especially art, non-touristy or geek-related – in the comments, I'd love that. Reader G.M. e-mailed this picture and said, "How the f**k I ever believed that THIS was E.T., I'll never know -- but I still played it for hours and hours." Around 1982 or 1983, before City Walk at Universal Studios was even an idea, there was a big E.T. thing at the top of the hill, by the Whomphoppers and Victoria Station restaurants. Part of it was a giant silver spaceship (just like E.T. 's) that had eight or twelve Atari consoles around a pillar in the middle, all of them playing the E.T. video game. I was seriously into video games then, and my parents had given me permission to play the E.T. game for like an hour or something while they did whatever parents did at an E.T. exhibit. (Eat lots of Reese's Pieces, I suppose.) I was beside myself with glee ... until I played it for about ten minutes. It was the most beguiling, horrible, opposite-of-fun experience I'd ever had. I found my parents and asked if we could leave. We've all heard the legend of the landfill, and the way I remember it, that's probably where this game belongs, but maybe I'll dig up E.T. on Stella and see if it really is as awful as I remember it. I spend a lot of time remembering and writing about the video games I played while growing up, mostly because it's the closest I can come to actually playing them, until the magical day arrives when I have an entire room in my house dedicated to housing a classic arcade and console collection. I've written before about books and games as time machines and portals, but I've recently realized that the father away I get from the times those things transport me, the more important they both become. Maybe it's a geek's midlife crisis, or something, but I've really missed arcades recently. Whenever I play any classic arcade or console game, it's like I'm flipping very rapidly through a book with different places and years on each page; I see just enough to make an emotional connection, but it never enough to capture any details. I don't know what it's like for anyone else, but for me, when I pick up a joystick controller today, I pick it up in 1979, 1980, 1983, 1985. When I played Pitfall! at PAX, I played it in my living room in Sunland, my bedroom in La Crescenta, at Joey's house, at Josh's house, at Bobby's house. It's awesome that I can play every Atari game ever written using Stella, and it's a lot of fun to plug in an Atari Flashback for a quick Combat battle (I'm still training for our Thunderdome showdown, Shawn Powers), but those experiences aren't quite the same as playing an actual vintage Atari. It's pretty easy to walk into a Target or a Best Buy these days and get one of those joysticks that has a dozen or so games in it, and being able to play them in some form is always better than not being able to play them at all, but the joy I feel when I get to play on an actual console just can't be emulated. There's something about searching a box for exactly the right game, flipping the switches, and picking up an actual joystick to play Yar's Revenge or Keystone Kapers or Air Sea Battle that emulation just can't capture. It will be unsurprising, then, to learn that my favorite rooms at PAX were the Classic Arcade room, and the Classic Console Freeplay room. They were exactly what they sound like: the Arcade room had about a dozen games, including Sinistar, Dragon's Lair, Frogger, and a prototype game called Crazy Otto that eventually became Ms. Pac Man. The Classic Console Freeplay room had everything from Atari to Colecovision to NES to PSX to Intellivision to Sega Genesis. Photo credit to Enforcer David Johnson, who took many awesome pictures of PAX East. While we played, Storm and I channeled our inner 12 year-olds with such classic phrases as, "No way! I shot him!" and "It cheated! The computer cheated!" and "MMMMOOOOOOOMMMMM!!!!" I remember when I got my Vectrex in 1982 or 1983; it felt like I had a miniature arcade game, because - unlike even the best Atari versions - it recreated games like Scramble, Armor Attack, and Star Castle almost perfectly. Minestorm was like Advanced Asteroids, and Starhawk was pretty much Luke Skywalker's attack on the Death Star, brought directly into my bedroom, under my control. I may have played the Star Wars soundtrack on my record player while I assumed the role of Red Five. Many times. I'm just saying. Storm and I got a little misty-eyed when we watched a father teach his son how to play, and I noticed that both of them were having an incredibly fun time, for entirely different reasons. Storm said that the picture I took of them was like a geek's version of the Norman Rockwell painting where the dad is teaching his son to fish. I thought that was awesome. But I think the best thing Storm said was in reply to an e-mail I sent him and Paul with a link to those pictures: "Ponce de Leon was completely wrong about the fountain of youth."